P188775-BN is rated 2.3 out of 5 by 6. Pressure balance valve keeps water temperature within +/-3ºF. Single function operation - Single handle for ease of temperature control. Rated 1 out of 5 by Willan from Leaking Just moved into my new home and the shower facuet now is leaking 5 gallons a day unknown to me. I was just so upset. Rated 1 out of 5 by angry from continues to leak Plumbers installed 2 of these in May 2018.2 bathrooms and the water barely comes out of the shower heads thus takes me twice as long to rinse off. The faucets in one bathroom leaks from tub faucet and the mechanism that engages the shower on the faucet does not drop after shower. This has been put in twice by plumber and at present is still leaking. Is this the product or the plumber? Please give us your input. Rated 1 out of 5 by Peachy from Handle fell off. That handle fell off in the first week of having it. It stripped the screw on bit trying to get it back on. . So now I have to put a screwdriver in the hole to turn my shower on cause I cannot find a replacement part and cannot afford a whole new faucet. Rated 5 out of 5 by pakman from Many good features Product purchased for both shower install and bathtub install. The valve was easy to configure and installation went smoothly. 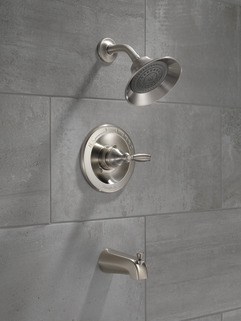 Would have been better for me had I known if I could have gotten just the shower fixture only for my one bathroom. I would heartily recommend this product to anyone who is considering upgrading their bathroom(s). Rated 1 out of 5 by Doug from Leaks Leaks Leaks I purchased this Tub and Shower Faucet on February 24, 2014 , [ 14 days ago]. I installed it on Sat. Mar. 8, 2014 using unions so no heat would be transfused to the valve body, and if I would ever need to take it out it would be easy. As soon as I turned the water back on it started dripping from the spout. On Monday Mar.10 , 2014 I took it back to the store I purchased it from. They gave me a replacement, and I just finished installing it. GUESS WHAT? As soon as I turned the water on again this replacement started dripping worse than the original one did. This product is junk. I plan to take it back to the store tomorrow and get a Moen. 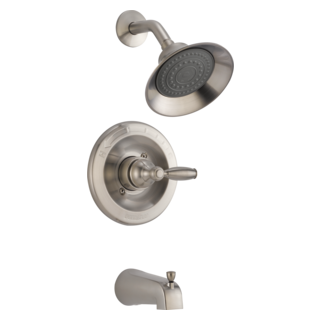 How do you safely clean the shower head exterior and interior to remove hard water satins and ensure proper water flow- to avoid clogging? slow drip from tub feeder. NEED to fix. remove handle, exposed spindle. Can the water volume be adjusted when showering for more or less water with just the one handle? Diverter pull lever does go down automatically after turning off shower off. 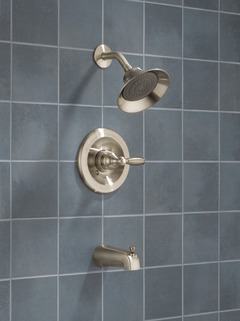 should the diverter lever go down automatically after shutting off the shower handle to release the pressure release the water remaining in the shower head. What is the size opening on the tub spout. Mine is anout 1 inch and i cannot find them locally. Is there a way to increase the water pressure? Is there a removable water restricter in the head? Can I change the water flow volume with this valve? If so, how? 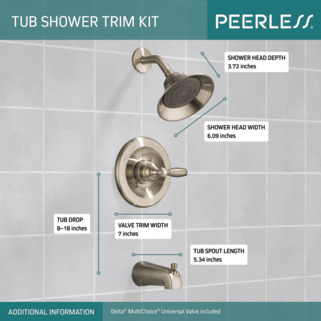 In many shower heads you can remove the low flow valve to give more volume. 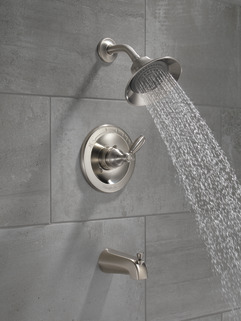 Is this possible with this shower head? I looked at the materials on this site and still have no clue as to how to fix a leak. How does one replace the cartridge or O-rings?